Hotel Review: Andaz Singapore (Andaz Suite King) - First Andaz Hotel in Southeast Asia! I am a huge fan of the Hyatt brand and even though I have lost my Globalist status earlier this year, the Andaz Singapore has been my most anticipated hotel to open in Singapore this year. Occupying the top floors of one of the iconic DUO skyscrapers, the Andaz Singapore is the first Andaz-branded property to open in Southeast Asia. More importantly, it is a product of two very famous and established architects - Ole Scheeren and Andre Fu (whom I personally love - check out the amazing Kerry Hotel, Hong Kong which I stayed in a couple of months back!). Click HERE to check out the Andaz Singapore! If your preferred mode of transport is the taxi, you might have trouble finding this place since it is really new but if you tend to use Uber to get around (good decision! ), you will probably not have any issues. If you really do have trouble directing your driver to this property (and this difficulty will only go away with time), the Parkview Square is located just a stone's throw away and it is probably a better landmark for less-experienced drivers. I took the lift up to Level 25 (where most of the restaurants are) to check-in to this highly-anticipated property ahead of the official check-in time. After a minute's wait or so, I was given the key cards to my suite and off I went to Level 31 where the Andaz Suite King was located. It is definitely worth noting that there are very few suites here at the Andaz Singapore so if you are a World of Hyatt Globalist member, you may wish to use one of your guaranteed suite upgrades here. Alternatively, I would highly recommend for you to book a suite instead of a regular room if you can - the price difference is nominal (approximately USD 100 at the time of writing) between the lead-in suite and the best room category. Besides, what is the worst thing that can happen in the event of an upgrade when you book a suite? Getting a better and bigger suite? The Andaz Suite King features 76 sqm of beautifully-appointed space - it comes with a separate living room and guest powder room on top of the bedroom and a full-size bathroom. You cannot imagine my excitement the moment I stepped into my suite. While I have been to the property on several occasions to check out the restaurant and the bar on my own, this was the first time that I actually saw the rooms (apart from the renders that I have seen online). The living room of the Andaz Suite King is incredibly spacious - you can easily have six to seven friends here on the sofa if they are visiting. There are also wooden doors that can be shut (if you prefer) to keep visitors out of the more private areas like your bedroom or the main bathroom. You will find a Guest Powder Room that is connected to the living room and this is great for those of you who have friends over and do not wish to share your bathroom at all. Body lotion is also provided in the powder room which is not common according to my experience across various luxury hotels in the region. As you can see from the photos above, the living room of the Andaz Suite King is truly a delightful area - it features an earthly undertone with bright yellow and purple colours that pop out in the right places. There is also a small work desk by the side of the living room if you prefer to get some things done - power outlets as well as a USB charging port can be found on the wall, by the side of this table. If you have been to other Andaz properties before, you should know that everything in the minibar (apart from the alcoholic drinks) are complimentary so go ahead and pop open that can of popcorns or that can of soda to beat the sweltering heat in Singapore. With all that being said, I did find the price of alcohol to be extremely reasonable in the room. For instance, the gin, vodka and scotch were priced at just S$45++ per bottle. Even though this is obviously not the best rate that you can get in Singapore, it is probably one of the best rates that I have ever seen in a hotel - each bottle makes approximately four to six standard drinks depending on how strong you like your drinks. Also, when was the last time you saw a proper gin (that isn't that nasty Gordon's Gin) in your room? 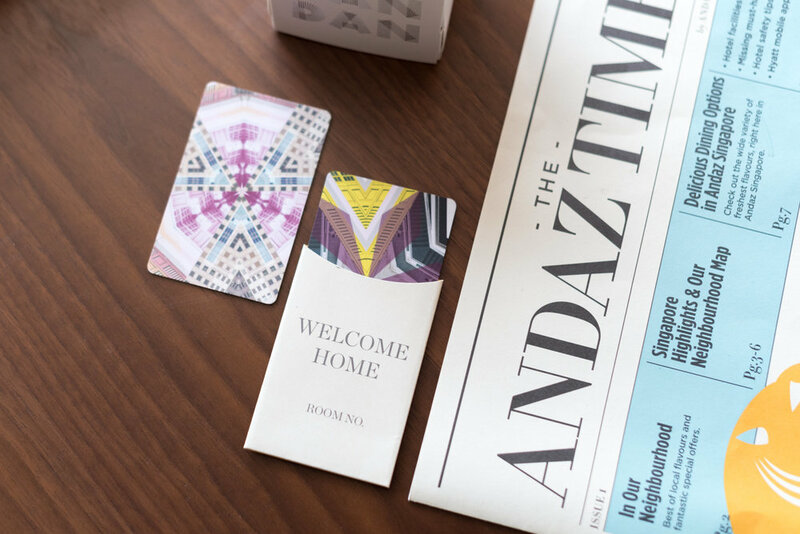 You will also find a copy of The Andaz Times here in your living room - inside it, you will find some handpicked recommendations (inside the hotel as well as outside) for you to checkout during your stay here. I love all the details that you discover during your stay here and I absolutely am a huge fan of the beautiful key cards that I was given - expect nothing of the ordinary here at Andaz Singapore! If you are a fan of coffee, you would be pleased to find a Nespresso coffee machine here in the living room. As far as I know, all of the rooms here in Andaz Singapore comes with a coffee machine and I think it is great that the hotel has made this investment in providing all in-house guests with decent instant coffee to enjoy (seriously, which self-respecting hotel in Singapore uses freeze-dried coffee still?!) - trust me, nothing beats watching your favourite program on that 55-inch TV while sipping on a solid espresso. Teabags from TWG are also provided in the drawer underneath the coffee machine if you prefer tea over coffee. Alternatively, head on down to the Sunroom (located on level 25) to enjoy complimentary coffee and tea all-day. There are two wooden doors that separate the bedroom from the living room - they cannot be locked - and the bedroom itself is gorgeous. There is a rocking chair located by the side of the room where you will find a lamp above you. This is obviously perfect for those of you who enjoy reading and getting rocked to sleep in the process of doing so. The Andaz Suite King features a king-size bed and I believe that all of the suites in this category do not have a twin-bed configuration. It is also worth noting that the beds here at the Andaz Singapore are on the firmer side (which is great for back support) and they are nothing like the Heavenly Beds (which are too soft for my liking) at Westin properties. There is plenty of natural light here in the bedroom (as well as the living) and you will get to enjoy a 270-degree view of the surrounding area. In case you were wondering, all the day blinds and night curtains are fully-automated and they can be controlled with the touch of a button. Needless to say, you will also find another flat-screen TV here in your bedroom so there is no reason to leave the bed unless you really have to. Power outlets as well as USB charging ports can be found on both sides of the bed but I was honestly taken aback to find out that the power outlets have not been made universal. Considering how much thought must have gone through in the design of this property, you would think that a detail like that would be taken care of. In any case, in the event you do need a universal adaptor, simply pick up your phone, dial '0' and someone will have it sent to you shortly. The Andaz Suite King also comes with a beautiful walk-in wardrobe which connects to the bathroom as well as the other toilet (there are two here in this suite). The walk-in wardrobe is also where you will find the safe, the iron (the ironing-board is cleverly stowed away here) as well as plenty of space for you to unpack your luggage - perfect for those long stays (lucky you!). There is also a huge full-length mirror here for you to channel your inner Andaz (which stands for 'personal style' in Hindi) before heading out of this beautiful property. The bathroom of the Andaz Suite King is beautiful and it comes with double sinks, two large bathroom mirros as well as benches for you to sit on - you will also find the bathrobes here. The bathtub at the end of the bathroom looks out to the other tower of DUO as well as the surrounding Beach Road area and if you are concerned about your privacy, the wooden blinds can be lowered with the touch a button (even though you have to push and hold it until it is done which is slightly annoying). All of the basic rooms here at the Andaz Singapore do not come with a tub so if this is deal-breaker for you, be sure to book a suite to avoid any potential disappointments - the Andaz Studio Suite, Andaz Suite, Andaz Large Suite as well as the Presidential Suite have tubs in the bathroom for you to relax after a long day out. The shower area (which comes with both a rain shower head as well as a regular handheld shower head) is located right next to the bathtub so feel free to step out of the tub without drying yourself off since it is the wet area after all. Bath Amenities here at the Andaz Singapore are provided by French perfumer, Christophe Laudamiel and a specially-created scent (Singapore Fusion #19) can be found in all guestrooms and suites here in the property. In case you are not familiar with Christophe Laudamiel, he is the same genius behind Fierce by Abercrombie & Fitch as well as Polo Blue for men by Ralph Lauren. You will find one set of bath amenities here in the shower area and body lotion by each of the sinks in the Andaz Suite King. 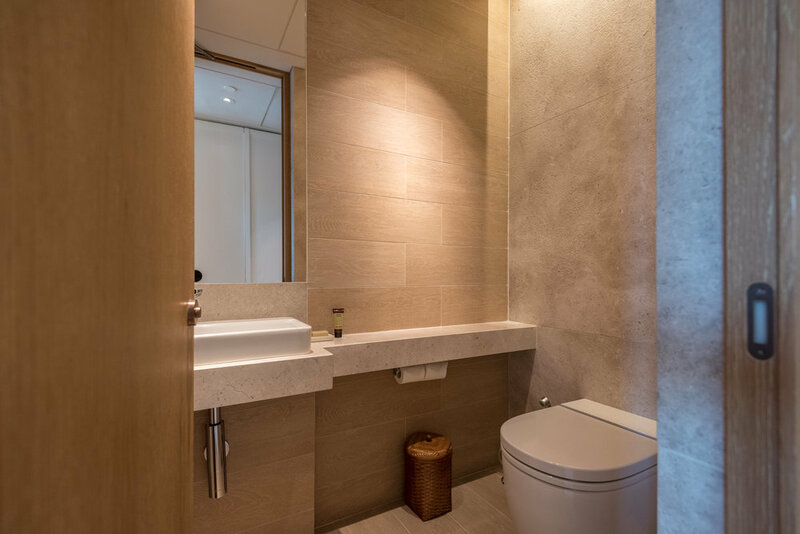 As mentioned earlier, the bathroom within the Andaz Suite King comes with another toilet which is different from the Guest Powder Room outside (connected to the living room). Andaz Lounge Hour runs from 5:00PM to 7:00PM in the Sunroom (which also serves all-day refreshments) and you will get to enjoy a selection of red and white wines as well as the famous Andaz Pale Ale which is created specially for the property in a collaboration with Singapore's very own Red Dot Microbrewery. You should know that the Sunroom is nothing like an Executive Lounge in a business hotel and more importantly, Andaz hotels are typically not required (or expected) to provide an area like that for hotel guests. Measuring the Andaz Lounge Hour here at the Andaz Singapore to a typical cocktail hour in luxury business hotels is unfair because the property has gone above and beyond what is required to provide hotel guests with a more inclusive experience (much like what The St. Regis Singapore does for Suite guests and Platinum SPG members). Do not expect to find complimentary food here but feel free to order from the menu which you can easily get from one of the beautiful Andaz hosts walking around the Sunroom. If you are in the mood for a swim, the swimming pool here at Andaz Singapore is located on Level 25 (yes the very same level as the rest of the restaurants). Remember to dress appropriately since you actually have to be walking through a public area of the hotel lobby (even though there is a short cut if you walk by the back) to get to the swimming pool - this is an Andaz hotel after all so make sure you feel free to channel your inner style. I got back to my suite after spending a few hours in the Sunroom (I also chatted with one of the nicest members from Guest Relations, Delia) and was rewarded with this beautiful view of the Singapore skyline from my living room. I am not sure whether all of the Andaz Suite Kings in the Andaz Singapore have the same view (I would assume not?) but I could see the Marina Bay area, the Marina Bay Sands and the Singapore Flyer from my very own living room. Hotel guests have the option of having breakfast either at Auntie's Wok and Steam (with a more Asian-focused menu) or Icehaus (with a more Western-focused menu). I opted for the latter as I wanted eggs for breakfast and also because I was at Auntie's Wok and Steam the previous afternoon as I was too lazy to head out of the hotel for food (and also because CATH members get to enjoy 15% off F&B for a limited time). 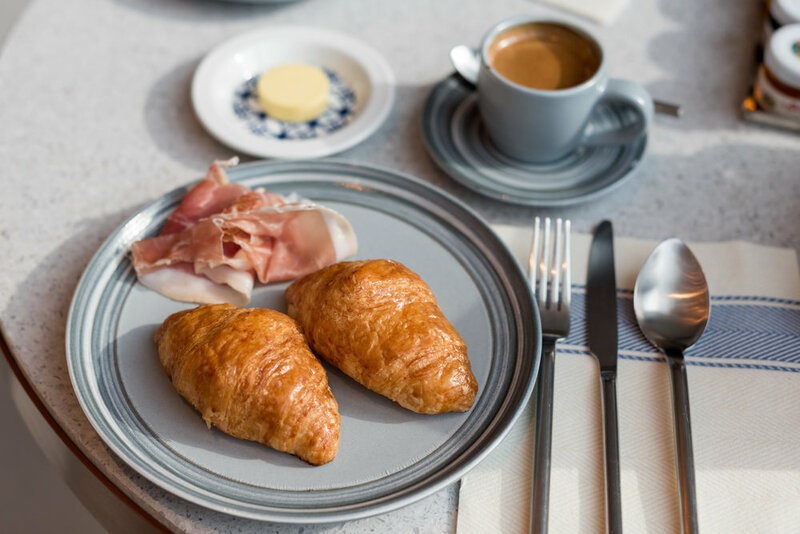 Hotel guests have the option of having either just the continental spread (S$24++) or with a hot dish (S$35++) as well - my room rate came inclusive with the full breakfast option and so I decided to start with some croissants and cold cuts from the limited buffet spread. I opted for the Roast Portobello Mushrooms (S$21++) as part of my breakfast which came with two beautifully-poached eggs, truss tomatoes, half avocado, wilted spinach, mushrooms, goat cheese feta and a sourdough toast. While I did crave for the variety of a full buffet spread, I was actually quite thankful that the breakfast options here are lighter and healthier (even though a guest staying in the property for a prolonged period of time may quickly get bored of the selection here). As part of the continental buffet breakfast experience, you will also get to enjoy cold-pressed juices (something you do not find very often in hotels since it can be quite costly to provide). I actually helped myself to two servings as the juices were delicious! 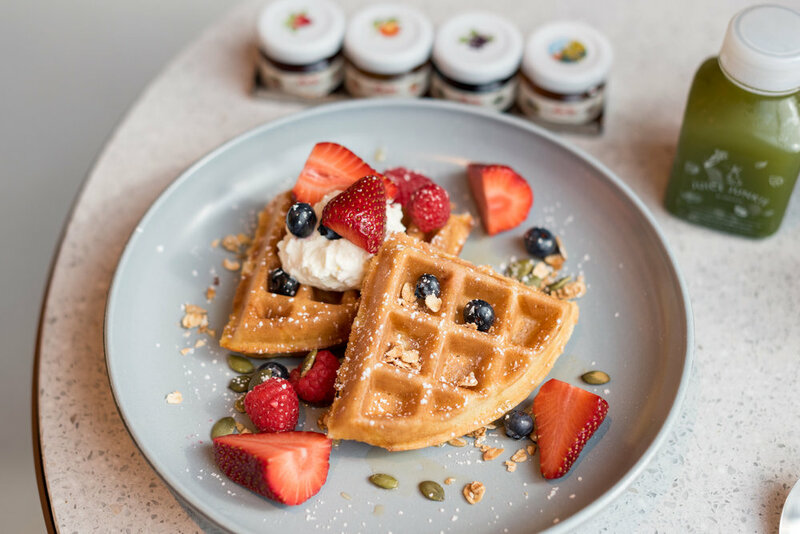 For dessert, make sure you check out the freshly-made waffles and feel free to garnish your dish with fresh berries on the side. Breakfast here at Icehaus is not what you would typically expect to find in a large business hotels - the buffet spread is limited to just continental offerings but what you do get however is a much nicer dining experience. If you wake up craving for oily and greasy food, Icehaus is not for you. However, if you wake up feeling like you want something healthy and fresh to start your day, I cannot recommend this place more - it has everything from cold-pressed juices, fresh fruits and cereals to help you take on the day ahead. At the end of the day, I guess the question remains as to whether or not the Andaz Singapore lived up to its expectations. Design-wise, I think the property is amazing and Andre Fu in particular has done such a great job in integrating elements from the neighbourhood into the interiors of the property in a non-ostentatious way. The Andaz Suite King that I stayed in is beautiful and even though the evening turn-down service was not perfect, I believe this is due largely to how new the property is (and possibly how foreign the staff is to the brand). Some restaurants on Alley on 25 are better than the others and I am personally quite excited to see how the new 665°F (which will only be opened in the evenings) takes shape in becoming the dominant and signature restaurant of the Andaz Singapore. The only improvement that I can probably think of for the Andaz Singapore is the way service is being delivered. It is important to note that this is in no way an indication that I have received any form of bad service during my stay. Instead, what I thought was lacking was the natural initiative and service-mindedness of the guest-facing staff - they were nice but my personal opinion was that they did not know when and how to approach things naturally (again, possibly due to how new the brand is to them). Would I come back to the Andaz Singapore for a stay? Absolutely - in fact, I have already booked the very same Andaz Suite for the year ahead.